To learn more about the current issues of a country or your country, please do not rely on a news source. Try to read and watch as much news and documentaries from all kinds of the reliable sources in order to understand the situations before jumping into the conclusions. With so much going on in the world today, one can see how easy it would be to get confused. Are those pictures of the war in Iraq or Afghanistan? Poverty in Somalia or Congo? And what’s a news program to do if there aren’t any good pictures? So producers all over the world search, and talk to their own crews or news agencies who provide feeds for everyone, and find the best shots to grace their air time. Or – in some cases – ANY shots that look more or less similar to the covered topic. 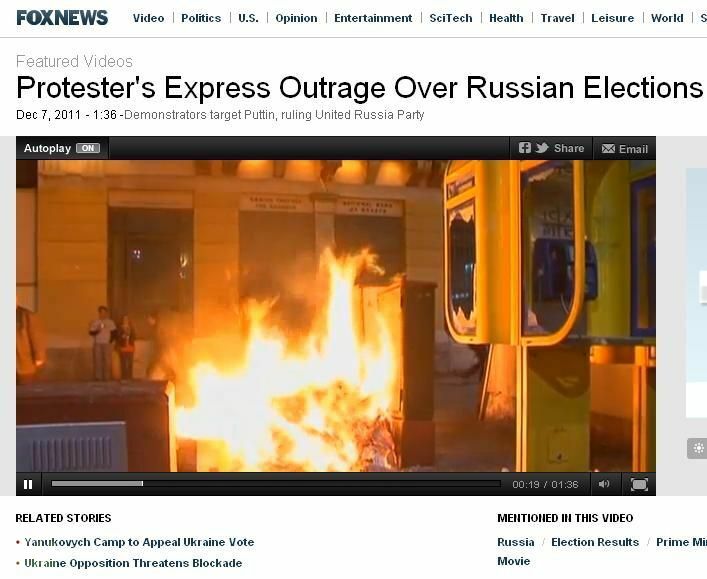 Case in point: protests in Russia and the ever-blundering FOX News. Yes, there are mass protests in Russia. Have been, since election day on Sunday. Thousands have been gathering to speak their mind and protest the election results. Yes, hundreds have been arrested. For two days in a row, and for various violations. Yes, there are reports of police brutality and no; right now it’s not possible to say whether they are true. It really does depend on the cops – much as it does anywhere else in the world. In New York, for example, some police officers will look the other way when you are filming somewhere you technically shouldn’t be; and others will detain you outside the United Nations building for no reason and refuse you your rights (and yes, all this did happen). Cops in Moscow are the same – some are nicer than others, while some appear to be almost looking for a fight. Regardless of all this – yes, there are protests. But this, my friends, is NOT them. Now, even though FOX news has kindly told us that this is, in fact, Moscow – as a Muscovite, one glance is enough to tell me it's NOT. First of all, the phone box – ours are a greyish-blue, and are few and between. In fact, I can’t even remember the last time I saw a public phone box, let alone anyone using it. Secondly, the people in the background – the young couple pressed against the building? They’re dressed in jeans and long-sleeved tees. It’s December. In RUSSIA. No one in their right mind would go to a rally (where most of the time, a lot of standing around is involved) in a tee shirt. People here wear thermals, ski jackets, hats and gloves – the works. Stereotypes are based on fact, you know – and Moscow is very cold in December. But even if all of this isn’t enough to convince you – and believe me, I do not want you to just take my word for it, here is my final argument. You may say ‘Hey, that looks Greek to me” – and you know what, you’ll be spot on. Greek it is – literally. And that sign? Says “National Bank of Greece” in those big, pretty, gold letters. FOX, it appears, isn’t satisfied with the REAL Russian rallies. They wanted a BANG! But there were no bangs, so I figure they thought “hey, it’s police running after people and fires and chaos – who on earth will be able to tell the difference? 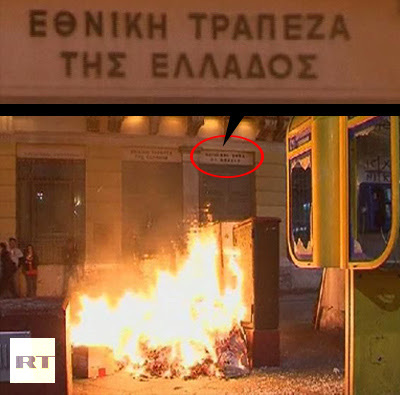 !” So they took videos from Athens, put a ‘’Russia” comment on screen – and voila, stick a fork in ‘em, they’re done. How unfortunate that their broadcasts can be seen by pretty much anyone, anywhere. I don’t harbor any hopes that the FOX people will see this and suddenly change their “errant ways”. But for the viewers – there are no palm trees in the streets of Moscow, the Prime Minister is spelled ‘PuTin’, not ‘PuTTin’ and the plural for ‘protester’ is ‘protesterS’. For future references.